We all love to get something for free, right? And we love it even more when we get to choose what we get for Free. So, from now until Christmas Eve, I will be giving away an additional FREE doll clothes Pattern of YOUR choice with every ‘How to Make Doll Clothes’ course. That means, for a short time only you’ll be getting a total of 9 Free doll clothes patterns when you purchase my course. This means you will have all the doll clothes patterns you need to make a complete wardrobe. To take advantage of this awesome deal, all you have to do is purchase my online course or DVD set and then email me the name of the pattern you would like to receive as your extra special Christmas bonus. 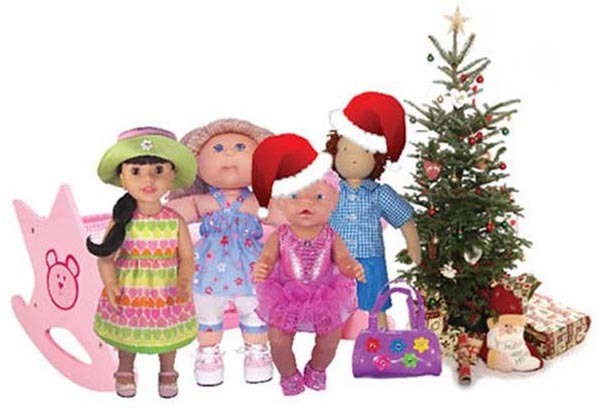 I will then add that pattern to your online membership, or for those that purchase the DVD set, I will set you up with online membership so that you can access your extra special Christmas Bonus doll clothes pattern even before the DVDs arrive. The value of this offer is simply amazing! You get my How to Make Doll Clothes course with over 130 video tutorials showing you all the tips and tricks that will take away your fear of sewing doll clothes. PLUS you also receive 9 Bonus doll clothes patterns with step-by-step video tutorials so you can start making doll clothes straight away. That’s a total value of up to $107.49 ($127.49 DVD set) for only $49.94 ($69.94 DVD set). ‘Sew’ what are you waiting for? Buy my How to Make Doll Clothes course today, tell me what pattern you want as your extra special Christmas bonus and start sewing beautiful doll clothes to give as Christmas gifts. Or purchase my course to give as a Christmas gift to that special loved one who would love to learn how to sew and let them choose which pattern they would like as their extra special Christmas bonus. So come and buy my course today and receive an extra special Christmas bonus!